This is my first regular weekly commentary of 2009. (Last week was the 2009 Predictions Issue; check back in a year and we will see how we all did. You can read everyone’s predictions on the Buy High Sell Higher 2009 Predictions page). Given the length of last week’s posting, I will keep this one much shorter. The markets were down this week (where have we heard that before?). In Canada, the S&P/TSX Composite climbed to its highest level in nearly two months early in the week, and the pulled back to finish at 9085, down 149 points from Monday’s open. Gold finished the week at $853.50 up 1.3% after leveling off from its pre-holiday rally. In the U.S., the Dow closed at 8,599, down almost 5% on the week. It appears to me that we are still in a down trend on the Dow (where else can you find this brilliant and decisive analysis?). It would appear that we need a break above 9,500 to confirm that a bottom is in, but I rise to 10,000 would be better confirmation. With all of the horrendous economic news out there, I don’t see that happening. However, the U.S. gets a new president on January 20. So far, he is very popular. He has done a great job of lowering expectations, warning about 10% unemployment, and talking about the need for tax cuts and economic stimulus. (I thought we tried economic stimulus last year and it didn’t work? Oh well, guess we need to try again). (Have you noticed that I seem to be using a lot of brackets in this commentary?). The new president will give a rousing inauguration speech, many parties will be held, and much positive press coverage will ensue. People will feel good. 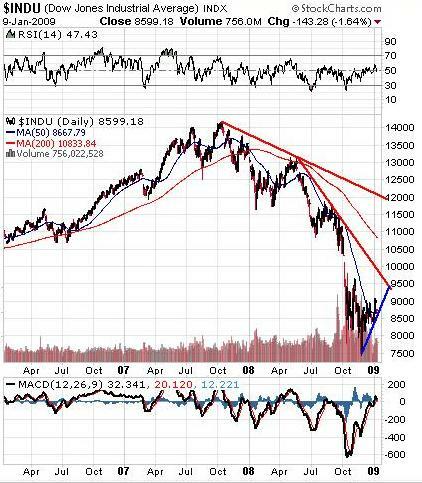 The “dawn of a new era” will induce people to believe the worst is over, and buy stocks. The promise of more economic stimulus will induce people to buy stocks. Therefore, I am assuming we will have a brief and perhaps powerful rally over the next few weeks. For that reason I have closed out all of my short positions (like the RSW – Rydex Inverse 2X S&P ETF), and I am sitting with cash. On the assumption that this renewed buying strengthens the U.S. dollar temporarily, I have also reduced my gold share holdings. My guess is that the new administration will do exactly what the old administration did: keep the price of gold down to mask the weakness in the U.S. dollar. 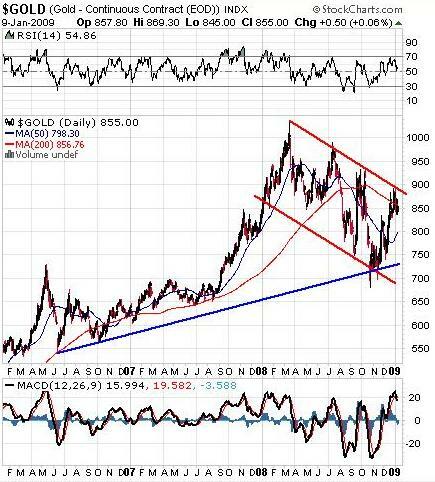 Gold has been in a down channel since last March, and is now trading near the top of that channel, so I expect some further weakness, which is why I have lightened up on my gold share holdings. As a result, I am now sitting with 56% of my portfolio in cash. Do I expect the market to continue rising, and gold to continue falling? No. I expect, after the initial Inauguration Euphoria, that the market will resume it’s descent, and gold will continue it’s long term increase. I don’t know the exact timing, or even the approximate timing, so I have already put in my stink bids on the stocks I eventually want in my portfolio. I have stink bids in on gold and silver stocks, as well as some junior players in gold, silver, and uranium. If we have big down days I’ll get filled, and then I’ll cash in on the big up days, since I assume we will see a return to the volatility we saw in 2008. If there are profits on the table, I will take them. (As another bracketed aside, there was an interesting link posted by dananini on the Forum this week regarding our old friends Mr. Dines, and Sheldon Inwentash, and MGA.TO – Mega Uranium Ltd. and PNP.TO – Pinetree Capital Ltd.; I won’t repeat the discussion here, but it’s worth a read). One of the lessons I learned in 2008 is that there is no shame in holding cash. If the markets crash, I’ll be happy I have cash. If the markets go up, I will wish I was fully invested, but until we see how the world shakes out, cash is not a bad thing. If time permits this week I will do a review of the uranium sector; there are some bargains to be had, but only if the market turns upward, so I’m keeping my powder dry on that for now. As always, thanks for reading, and see you next week.